When we think of holiday shopping, our minds typically envision shoppers running rampant up and down aisles of mega-stores and scouring shelves for the best deals. But more and more each year, shoppers are supporting Black Friday’s quieter and more respectable sister, Small Business Saturday. In the past, people shopped locally because mom-and-pop shops—which are independent, small businesses—were the only stores available. But with the rise of big-box stores and luxury came the fall of shopping local. Small Business Saturday, though, is relatively new and has gained traction the last few years. American Express launched it in 2010 to encourage shoppers to support local businesses and lead to the rebirth of shopping local. Nearly three-quarters of US consumers know about Small Business Saturday. According to the 2017 Small Business Saturday Consumer Insights Survey, four in 10 American adults—that’s 43% of the population—either shopped or dined small on the day. Thanks to the internet, mom-and-pop shops are thriving, as online storefronts make it possible for small businesses to cut back on overhead costs and social media offers a less expensive advertising route. 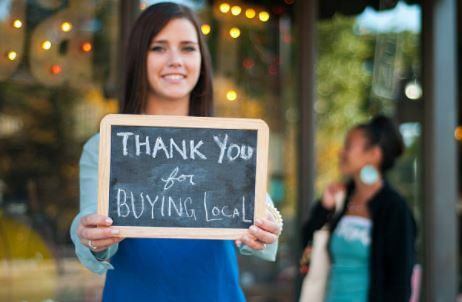 Additionally, more people are becoming aware of the benefits of shopping local. Beyond having the opportunity to purchase more unique products and enjoying a more personalized shopping experience, shopping local is economically beneficial. Small businesses play a key role in helping communities thrive. For every $100 spent at a local business, $68 goes back to the local economy, compared to $43 given back for every $100 spent at a national chain. Additionally, shopping local creates more jobs in the community, rather than in factories across the globe, and reduces environmental impact, as products don’t have to ship across the country to customers. Millennials are the largest cohort in the country, making up more than one-quarter of the US population, and they, more than other generations, like to shop locally. Due to their buying power, they’ve transformed retail patterns, with customers now expecting personalized shopping experiences and social interactions with the brand. Today’s shoppers care just as much about the shopping experience as the items they purchase. Millennials desire a stronger connection to the products and services they buy, and they also like to root for the underdog and give back to their local economies. Small businesses can capitalize on this and appeal to millennials since small retailers can offer a more personal shopping experience and more unique offerings that large companies can’t replicate. One of the easiest ways to do this is to take the time to talk to customers and get to know them. Customers appreciate being acknowledged and are more likely to turn into a repeat customer and refer friends if they feel connected to a business. Something as small as using their first name can turn a one-time shopper into a loyal customer. Additionally, small businesses can offer customers a more comfortable shopping environment. Superstores can feel sterile and repetitive, and the long checkout lines can deter shoppers. Small businesses can create a cozier feel through warm lighting, décor, and unique layouts that differ from the standard symmetrical aisles of chain stores. Promoting locally crafted products at the front of the store can also increase foot traffic—especially around the holidays when shoppers seek unique, high-quality pieces to gift loved ones. Lastly, most large businesses can’t beat the customer service of small businesses. Making a few minor changes—such as an extended return time frame, loyalty punch cards, and referral discount programs—can drive repeat business and customer loyalty. · Spas and salons: Shoppers in Georgia, Idaho, Texas reported visiting spas, nail salons or hair salons the most. If there’s one thing we’ve learned from Small Business Saturday, it’s that the growth in shopping local goes far beyond the day after Black Friday. Even if consumers don’t shop on the actual day, the publicity of Small Business Saturday still heightens awareness, and customers will be more likely to spend more money at small businesses throughout the year. And a simple reminder through social media or in-store collateral about the benefits of shopping local can make a big difference in year-round shopping. Small businesses can benefit from these evolving shopping trends by fulfilling shoppers’ desire for a personalized experience during both the holiday season and throughout the year. This season, evaluate opportunities to increase customer satisfaction and promote the benefits of shopping local. Your soon-to-be repeat customers will thank you. We’re committed to helping small businesses like yours succeed and grow. Submit some basic information about your company and be entered to win up to a $1,000 AMEX® gift card!